High Ceilings: 6 Great Ideas to Copy! High ceilings epitomise class, elegance and luxury. Not simply an architectural detail that adds spaciousness to the floorplan of a home, high ceilings add an air of sophistication, and a majestic ambience rarely found in cramped or cloistered dwellings. High ceilings are a valuable feature to your abode, and should be looked at as a prized amenity providing unlimited advantages for the interior of your property. But how can you possibly make the most of this space, and what can one do to maximise its potential, while still retaining a roomy ambience? Often there are many different answers to these questions, and it depends on individual tastes and preferences. 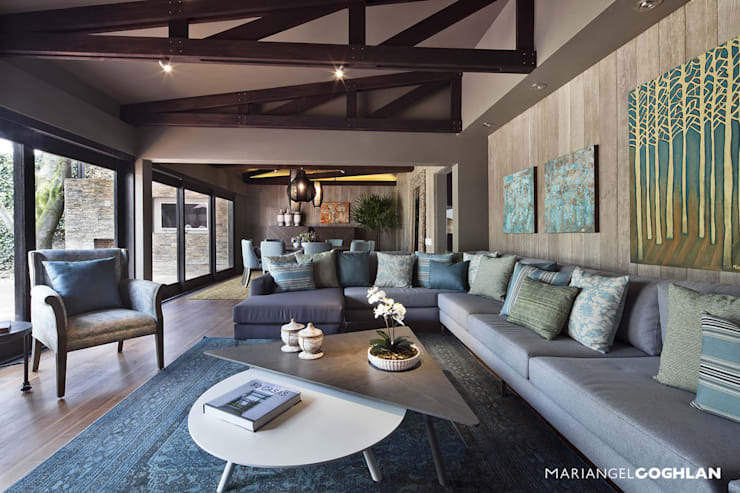 Colours, textures, additions, and treatments are all considerations that will change the way the high ceiling appears and feels within the home. Today on homify we are going to be taking a look at different ways you can maximise your high ceilings and walls, in a timeless and advantageous manner. If you have a home that would benefit from a bit of a makeover or refresh, check out the gorgeous examples below and get some inspiration and ideas for your property! Probably one of the most impressive ways to make the most of your high ceilings, a mezzanine literally adds floor space by employing the empty space into a usable room. Mezzanines come in many different shapes and sizes, from open and airy, to completely contained. A mezzanine can also help to accommodate a growing family, and adds valuable space to a home that might feel large but lack actual square metres. 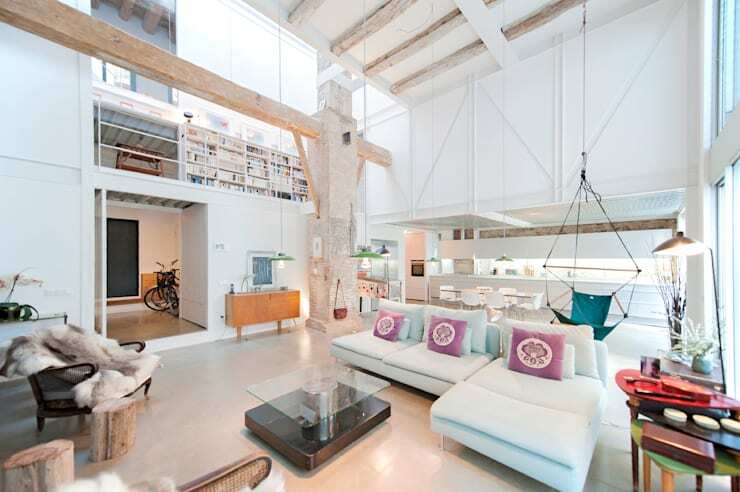 In this example we see a strikingly large and open living space that benefits from a mezzanine division. The gallery style corridor now forms the second floor, and leads to other interior spaces. The double height walls have been broken up with the addition of this mezzanine, adding interest and a cosy vibe to the overall residence. Ceiling finishes are a fabulous way to bring a little class and interest to a space with a high ceiling. False ceilings can take many different shapes and forms, but are usually gypsum board that is then painted to match the surrounding room décor. 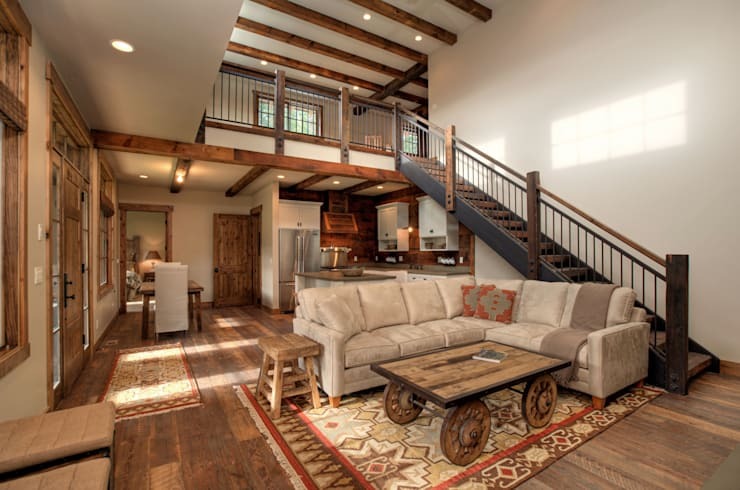 Other than the typical false ceilings, there are also many other rustic options that evoke a sense of country style and elegance. Exposed timber beams are extremely popular, and we love railroad (subway) style tiling that is often continued onto the ceiling. A false ceiling also gives the occupant the opportunity to change the interior colours within the space and textures can also be employed to create depth within the space. The image above is a great demonstration of a ceiling that has had large vaulted beams added to its overall aesthetic. The room is stylish and modern, with a snug and comfortable ambience. These add interest to the ceiling space, and help ensure the space is inviting and warm. Hanging objects benefit hugely from a large wall and a high ceiling. Nothing says grandeur like a hanging piece of art, a mirror, or light fitting! With high ceilings you have space to work with, and this can mean the difference between a space feeling cramped, and an area that feels welcoming and roomy. If you have a large living area you might consider delineating the different domestic zones with large statement making lights. Suspended lights look fabulous, and are even more dramatic when they appear to hover over a space. In this fabulous example we see the double height space utilises many different features to ensure the room is welcoming and interesting. A hanging chair is the standout feature, and works beautifully with the playful and light atmosphere. One of the most common issues within homes these days is the lack of storage. 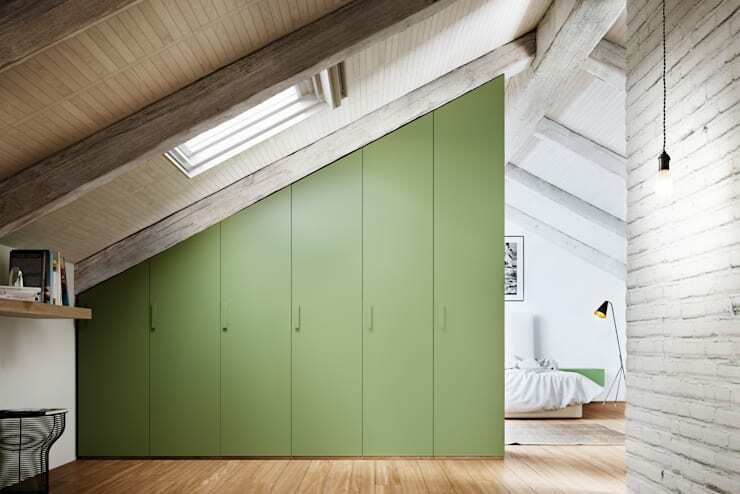 Storage comes in many different shapes and sizes, but if you are lucky enough to have a home with high ceilings, then you might consider utilising some of that to house cupboards or shelves. In providing yourself somewhere to store additional household miscellany, you will reduce the volume of clutter in your dwelling, and improve the overall vibe and aura of the space. If you are considering large storage or bespoke joinery, chat to a professional to ensure you get the best design for your space. 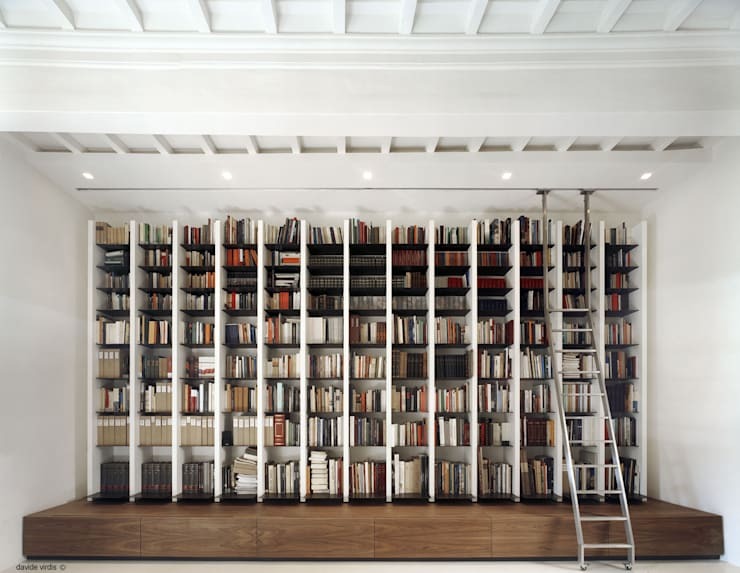 Similar to storage space, shelving is ideal when paired with high ceilings and tall walls. Think about the space and where you wish to display your items and invest in interesting pieces of furniture or go bespoke and have something custom designed for your room. A large shelf or series of shelves will add depth to a space, and help to create a sense of majesty. Additionally, and far more practically shelves are a place to keep all of those domestic curios and objet d’art that might be left to collect dust in a cabinet. In the image above the large bookshelf is a stunning example of how to utilise a high ceiling. The wall is entirely taken up with a library-esque setup that adds a sense of industrial chic style to the room. Art instantly improves a home, but one of the most common dilemmas is where to hang and display it. Most dwellings suffer from many of the walls being taken up by windows, doors, or other pieces of furniture like bookshelves, however if you are blessed with high ceilings, this might mean you have space to hang larger and more impressive pieces. Make a statement with your large walls and high ceilings to impart interest and uniqueness to your abode. You can also use art to enhance the architectural style of your home and its walls. If you have a sloped ceiling you could try arranging the wall art to mimic the strong design lines and shapes. In this example we see a beautiful warehouse style interior that maximises its large white walls and high ceilings to create a sense of mystery and serenity. The art is large yet not oversized, and looks perfect contrasted against the light colour scheme. Do you have high ceilings or large walls in your home? We'd love to hear any tips or tricks you may have for our readers!